The handy but sturdy Orbit 7120 was especially intended for applications that require stylish design with a minimum of required space. The Orbit 7120 Orbit is an aggressive, omni-directional laser scanner for barcodes. It is not only intended for the use as a standing projection scanner – its low weight of only 380 g make it possible for use as an omni-directional handheld scanner as well (e.g. for scanning large and bulky objects that cannot be lifted onto the cash desk). The scanner is activated automatically, whenever a barcode comes into the scanning range of the integrated infrared sensor. As it is an omni-directional scanner, it is not necessary to align it to a scan line. 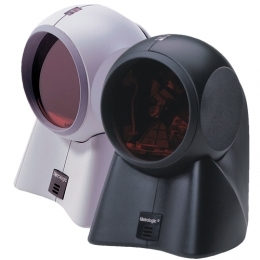 As a result, the Orbit 7120 is a very time-saving scanner with very good operating ergonomics. A high scan rate of 1,120 scans per second, a sophisticated shape and many other advantages easily make this scanner the perfect choice for cash desk systems in upmarket shops, boutiques, chemist’s, petrol stations, tobacco shops and 24-hour shops. The Orbit 7120 features a rotatable scan head that makes it flexible even if the included wall-mounting is used. The Orbit 7120 received several awards for its unique design. Its space-saving innovative design as well as a flexible scope of application made it the best-selling scanner at chemists’. High flexibility combined with modular system integration: various interfaces, such as keyboard wedge, serial and USB always guarantee a smooth installation. Scanned information can be manipulated with the help of the »Data Parsing« software in order to adjust it for any kind of application. This user-oriented barcode adjustment together with a vast number of programming options of the MetroSet2 Software allow even beginners to effectively use the scanner.